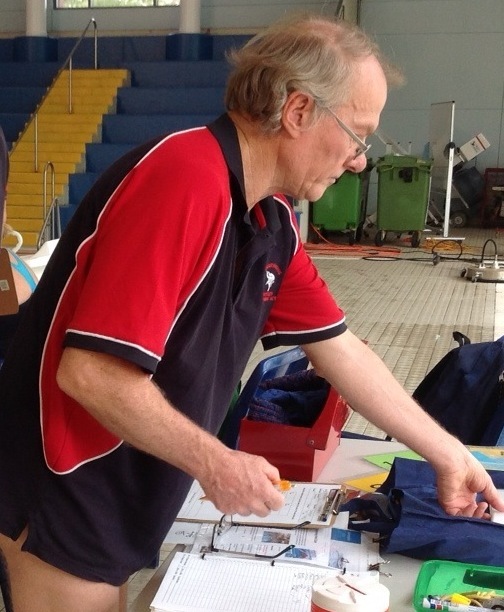 Congratulations to Jon McCrae who has been chosen as Masters Swimming NSW Volunteer of the Month for April 2015. Jon, as our Treasurer, has spent many hours working behind the scenes streamlining our finances over the last couple of years. He has introduced a training card payment system and organised our money collection at training to make it as efficient as possible. Jon has also been spending many hours upgrading our banking system, safeguarding our finances and working out the safest way our club can use internet banking. Our club really appreciates the work Jon has put into this as it is often an unsung position, but absolutely necessary to the functioning of the club. Congratulations Jon and thanks for all your hard work. 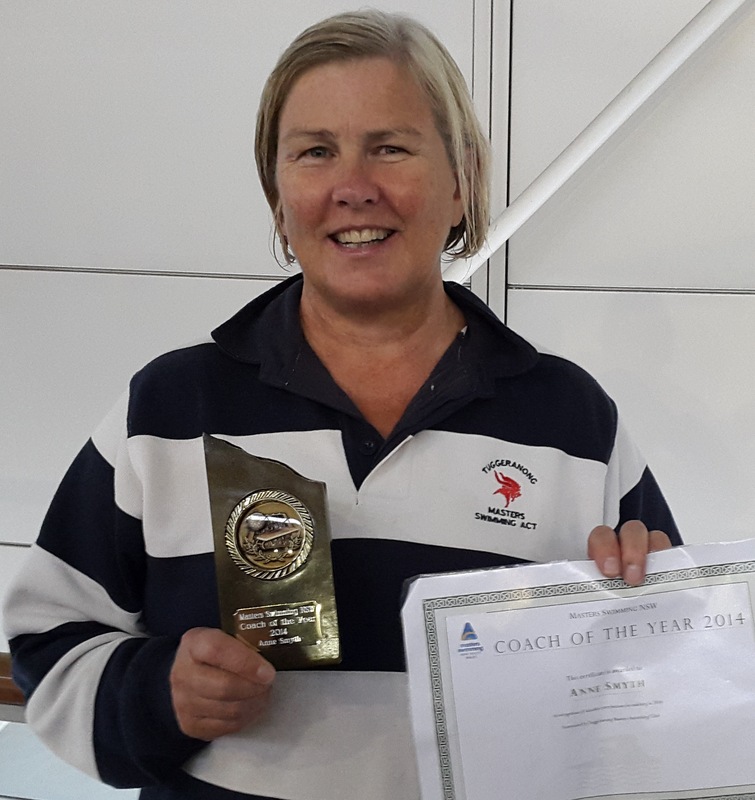 A massive congratulations to our Head Coach, Anne Smyth on winning the MSA National Coach of the Year 2014. 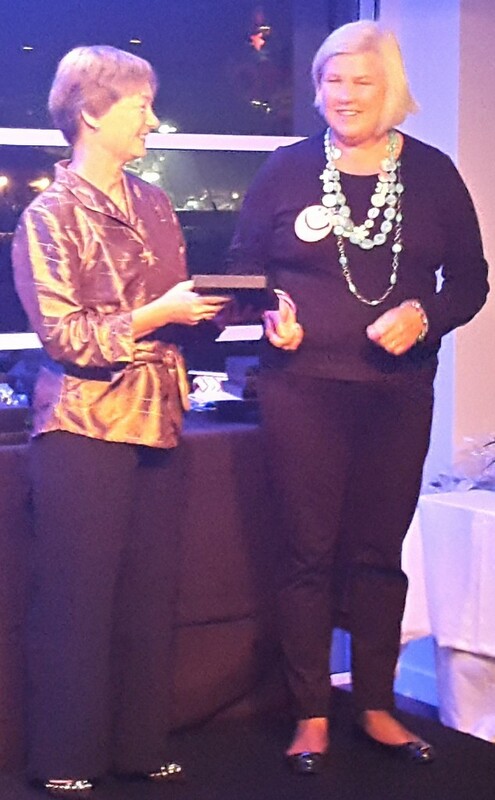 This award was announced and presented to Anne at the presentation dinner in Hobart at the conclusion of the recent National Championships 2015. The award follows on from Anne winning the NSW Branch Coach of the Year for 2014, and recognises the overall achievements of the club. It is not about state and national records or medals. It takes into account participation across all aspects of masters swimming, from endurance and our local ACT Interclub meets, to other club (NSW Branch Point Score), state and national events as well as open water events. It is about the work done within the club to support individual swimmers improve their technique and achieve their own goals, and the retention of swimmers and the growth of the club. Anne has spent time attending workshops and seminars, as well as researching online to keep up with innovative ideas and plans out the basis for upcoming training sessions around the events on the competition calendar. 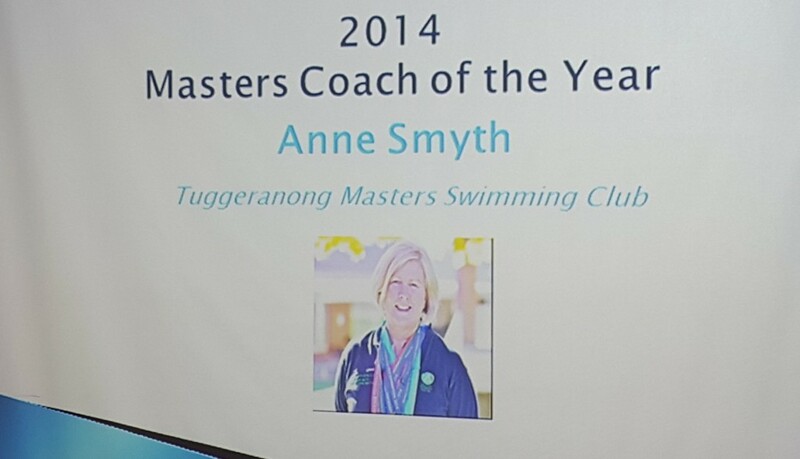 Anne’s encouragement to all swimmers and her positive attitude to coaching have contributed to Tuggeranong Masters Swimming ACT being a vibrant and forward thinking club that continues to expand and develop. As a close friend of Anne, fellow coach and our Club Captain, Caz was delighted to be able to write the national nomination for Anne. Below are some of the words which highlight why Anne deserved to win this fantastic award and we are sure that everyone will agree that this award is great news for our club and our team of coaches working with Anne to make our club one of the top clubs nationally! Well done Anne, what a fabulous achievement. We really value what you have done for our club! What a fantastic two days of racing it was for the Tuggeranong Vikings at the NSW State Long Course Championships on 20/21 Marchs 2015 at Sydney Olympic Park Aquatic Centre! It was a great team effort with the club winning the trophy for the highest average points/swimmer. We had some terrific relay swims winning gold in four events, showing the Sydney clubs that we are a force to be reckoned with. Marianne Tweedie’s last lap of the 4 x50m Mixed 120+ Medley Relay with Caroline Makin, Dan Guthrie and Kade Burgess, was a highlight of the meet, with Marianne mowing down two swimmers to take gold by a fingernail of 0.1 seconds on the wall. This same team also broke the long standing 4x50m Mixed 120+ Freestyle Relay club record set 18 years earlier back in 1997! 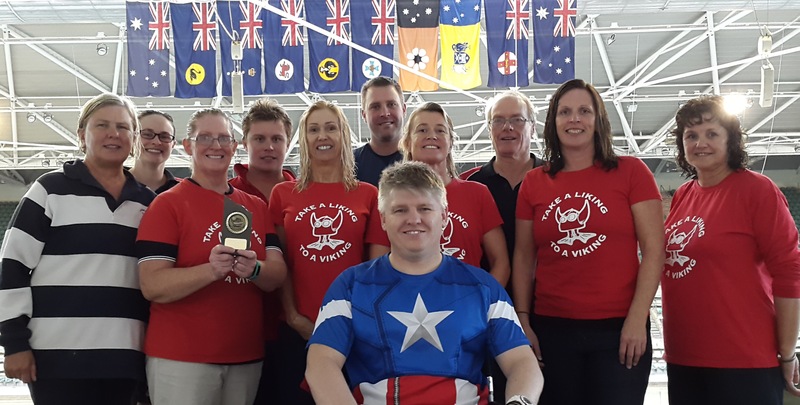 The hard work in training from our team is really starting to see results and, for the swimmers going to Nationals in Hobart from 8-11 April, this was a great lead-up! It was a fun meet and despite swimming hard, it is always a great time to catch up with friends, meet new people and enjoy the atmosphere around the pool. On the Friday night we enjoyed a meal and a few wines/beers at the pub after the racing and recounted tales of our exploits in the pool as well as sharing our thoughts for what lay ahead for our races the next day. It was great to have our new super-fish Dan Guthrie competing and he powered through his 50m events – big incentive now to get some training under his belt – look out for him at State SC Championships in Canberra in October! Otto Benda had a great first State meet with some strong swims on Saturday and Donna Campbell is really getting into racing, producing some good PB’s such as her 50m Backstroke. Leisa Cass had a strong 50m Freestyle swim and Brenda Day had a top meet, winning her 65-69 age group. Ian Hampton showed guts and power in finishing a very fast 50m Butterfly and Jon Mcrae had some excellent swims, notably his 100m Backstroke. Marianne Tweedie had a superb meet and was on fire in her 200m Backstroke and 200m Freestyle swims in in her snazzy new suit. Katrina Burgess and Caroline Makin showed they were in great form and ready for Nationals with Katrina turning in impressive 200m Backstroke and 200m Individual Medley times and Caz was delighted with PBs in her 50m, 100m and 200m Freestyle swims and ecstatic at breaking 32 sec for 50m. Kade Burgess is hitting his form – all his extra training is paying off with fast swims and winning his 18-24 age group. Gary Stutsel recorded strong swims, proving as usual that age is irrelevant to speed – love that double-arm backstroke! Anne Smyth was very happy with her 200m Butterfly – a good practice swim for this event at Nationals and David Bale produced a fast 100m Butterfly PB and is turning himself into a Backstroker with a great time in the 100m Backstroke! 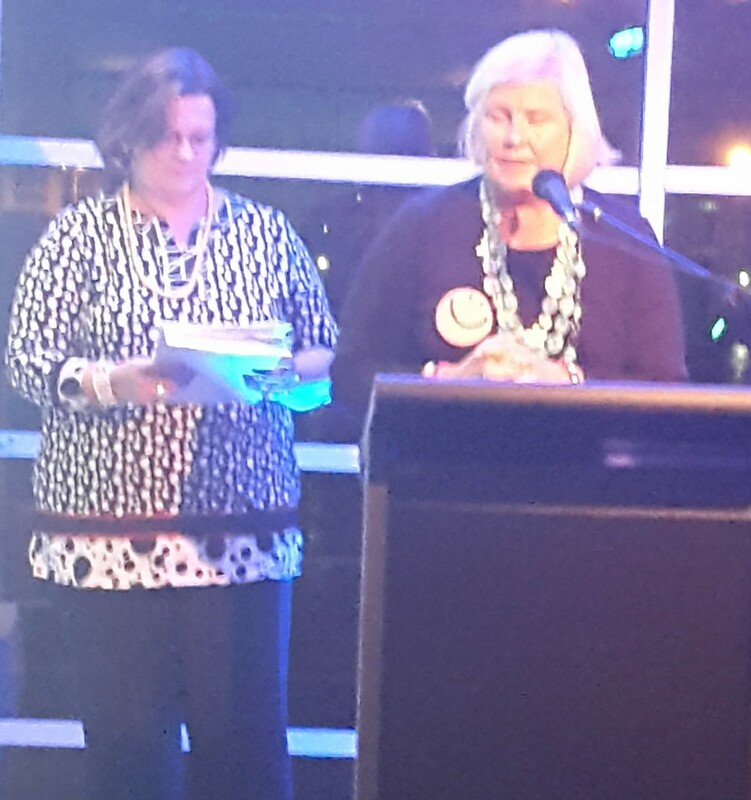 To top off the meet Anne Smyth was presented with NSW Coach of the Year Award for 2014. This is great news for our club and our team of coaches working with Anne to make our club one of the top in NSW. Our club growth and retention of swimmers, the improvement of swimmers’ techniques and times and our enthusiasm and support of one another is something to be proud of. 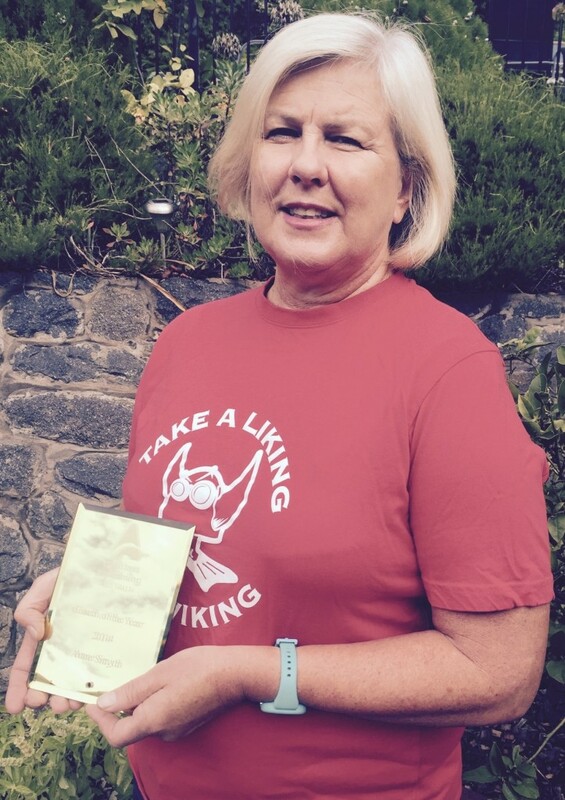 Well done all club members and our coaching team from 2014 led by Anne – Brenda, Leisa, Jeanette and Caz.